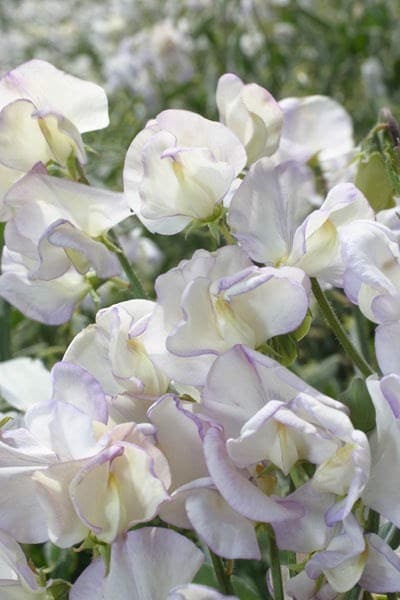 The delicate picotee colouring of this sweet pea, coupled with the flowers unusually powerful scent, make this a beautiful addition to the flower garden. Where space is at a premium, try filling large pots with them, and top it with a woven obelisk that they can scramble over. Throughout summer you will have a stunning feature for your terrace. 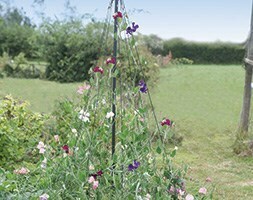 In our (not very scientific) sweet pea trial on the nursery, we found that this variety had the most fantastic scent of all. The flowers were held on very long stems approximately 6-9" long, but it only has a few flowers left in August.